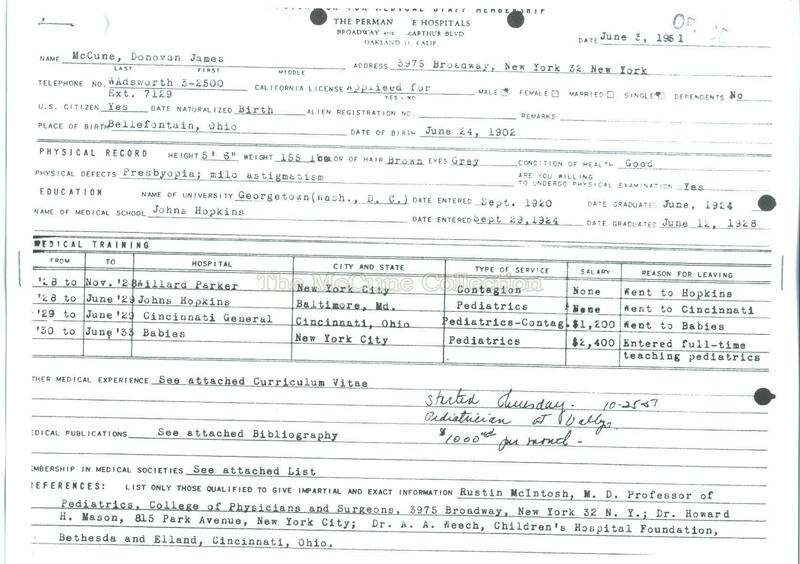 Donovan James McCune was born on June 24, 1902 at Bellefontaine, OH. He was the son of Christopher James McCune (1868-1955) and Laura Miller McCune. He married Mary Adams, M.D. on October 14, 1932 but the marriage had ended by 1951. His death took place in Vallejo, CA on April 11, 1976. Fluent in Spanish, German, Latin, classical Greek and he had a visual familiarity with French. He graduated in 1920 from St. Rose High School (Lima, OH) and then attended the University of Dayton (Dayton, OH) from 1920-21. Donovan McCune graduated with his A.B. degree in 1924 from Georgetown College (Washington, DC) and obtained his M.D. degree in 1928 from Johns Hopkins Medical School (Baltimore, MD). He was a consultant in pediatrics at Greenwich Hospital (1943), Greenwich, CT; Holy Name Hospital (1946-52), Teaneck, NJ; and Stamford Hospital (1947-52), Stamford, CT.
After approximately twenty years in the academic/teaching field, he decided to again become more involved in an active pediatric practice. In 1951, Dr. McCune began to work as a physician for Kaiser Permanente Hospital in Vallejo, CA. 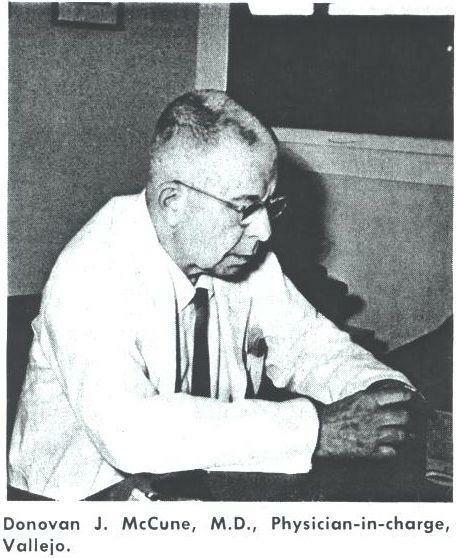 He held the position of Chief of Pediatrics and Physician-in-Chief from 1953-1965. In 1965, he was appointed to serve as the staff assistant to Cecil Cutting, M.D., Executive Director of the Permanente Medical Group in Oakland, CA. Dr. McCune also became a consultant in pediatrics for the U.S. Naval Hospital Mare Island (1957-58) and David Grant Hospital, Travis Air Force Base (1966-68). 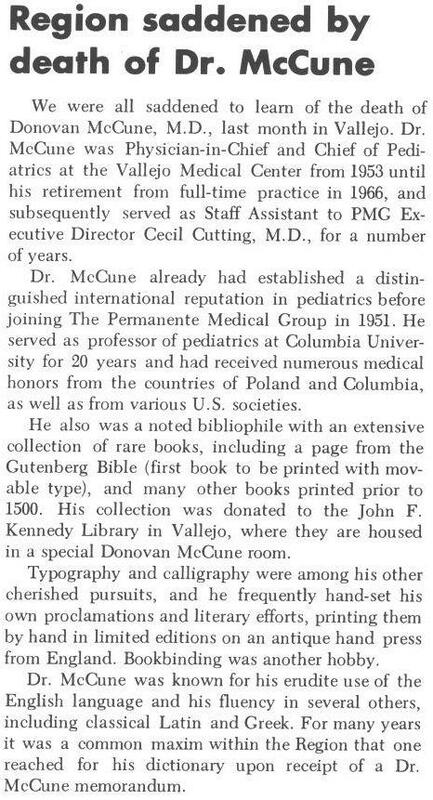 Dr. McCune was internationally known and some have called him one of the “fathers of American pediatrics.” He was involved in two international medical missions: 1) 1946 Unitarian-UNRRA Medical Mission to Poland, and 2) 1948 Unitarian Service Committee Medical Mission to Columbia. 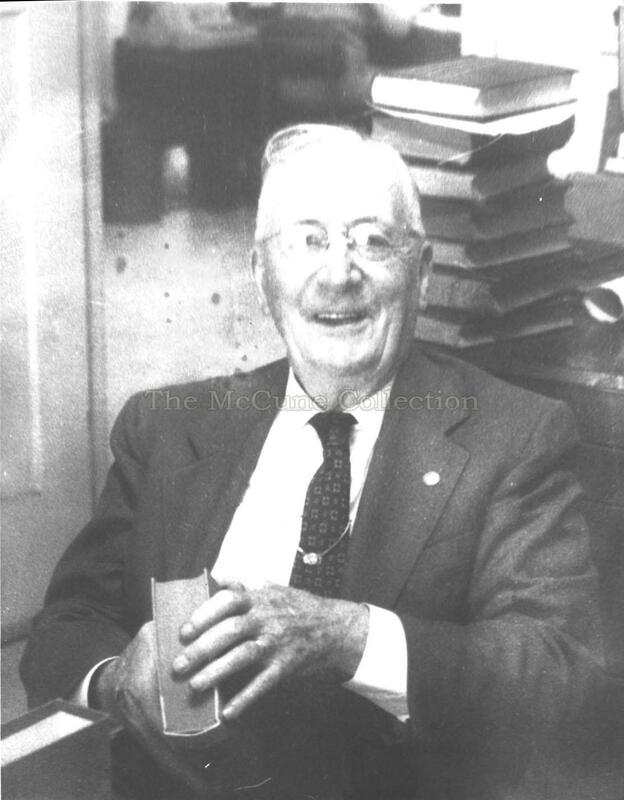 Dr. McCune was Associate in Pediatrics, College of Physicians and Surgeons, Columbia University 1931-37. He then held the positions of Assistant Professor (1937-1942), Associate Professor (1942-44), Professor in 1944, and Member of the Faculty of Medicine at Columbia University (1945-51). The McCune-Albright Syndrome (MAS) is a genetic endocrine disease affecting the bones and pigmentation of the skin. It was described independently by both Dr. Donovan J. McCune and Dr. Fuller Albright in 1937. In 1924, he was the Hamilton Debate winner. This was given to the best extemporaneous speaker in the annual debate put on by the Philodemic Society of Georgetown. While at Johns Hopkins, he was a member of the Pithotomy Club. The Club’s constitution stated its objective-“the promotion of vice among the virtuous, virtue among the vicious, and good fellowship among all.” While living in New York, he was a member of the Harvey Society, whose stated purpose was to establish a closer relationship between the purely practical side of medicine and the results of laboratory investigation. It set up a series of lectures on the life sciences. 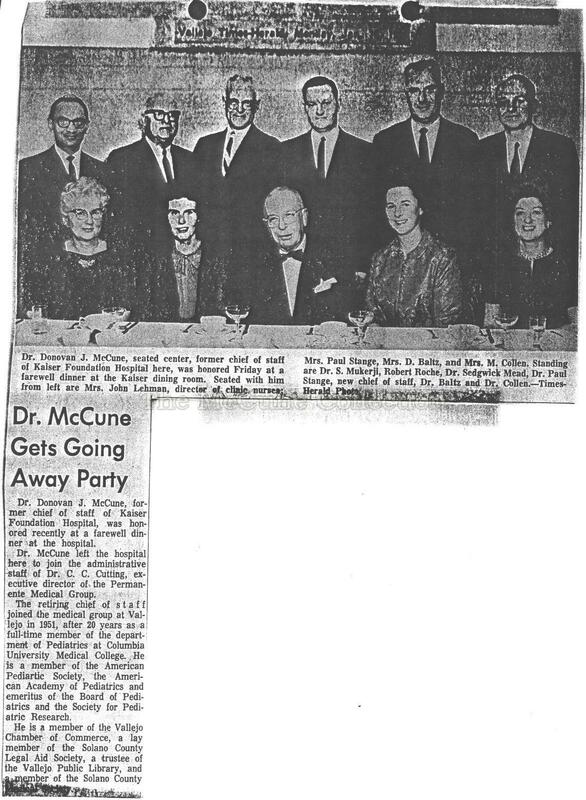 Dr. McCune joined the Vallejo Chamber of Commerce in 1957 and became the Chairman of its Committee on Public Relations for 1959-60. He was also was a member of the Board of Directors, Solano County Legal Aid Society starting in 1960. As such, he became a member, Solano County Council of Economic Opportunity, representing the Solano County Legal Aid Society in 1965. 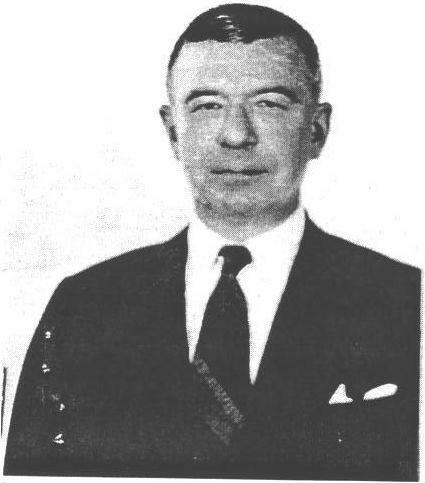 In 1961, Dr. McCune became a member of the Vallejo Public Library Board. In 1966, he was reappointed to another five year term. In 1968, he joined the California Library Association. He was a leader in the fund-raising efforts for a new library in Vallejo. The John F. Kennedy Library’s ground breaking took place on September 4, 1968, which was commemorated by Dr. McCune in a broadsheet printed by him on his own hand press. Dr. McCune was a true bibliophile and his collection reflected his wide range of interests: Latin and Greek literature; printing in all its aspects (ink, paper, movable type and binding); special fine printers (e.g., Grabhorn Press, Plantin Press, Nonesuch Press, Henry Evans, John Henry Nash, Valenti Angelo, etc. ); Californiana; and limited editions publications of the Book Club of California. He was a collector par excellence, interested in the material for itself and the knowledge and skill it reflected. For this reason, his collection was much more than books. It also included extensive magazines on the printing arts (e.g., The Fleuron, The Bookbinder, The Book-Collector’s Quarterly, The Colophon, Imprint, The Monotype Recorder, etc.) and ephemera from fine printing presses. As one friend pointed out, Dr. McCune’s collection was special because it was acquired from a genuine appreciation for the art form. Some of the gems of his collection were an original leaf from the Gutenberg Bible, The Kelmscott Chaucer, Oliver Byrne’s Elements of Euclid (1847), Don Quixote de la Mancha (Spanish Royal Acaedemy 1780), The Fable of the Hawk and the Nightingale (1959), Fables of Esope (1930), and James Cook’s Charts of Newfoundland (1965) to name just a few. His collection of books was donated to the City of Vallejo at his death and now makes up the McCune Collection. KP Reporter 1963 (McCune binding books) Another chief hobby was bookbinding. Dr. McCune first took this up in 1960 as a way to save money. He obtained some how-to manuals on the subject and taught himself the art. By June of 1963, he had done over 200 volumes and about 100 cases to contain the valuable items in his collection. He would rebind many of his favorite books in leather. 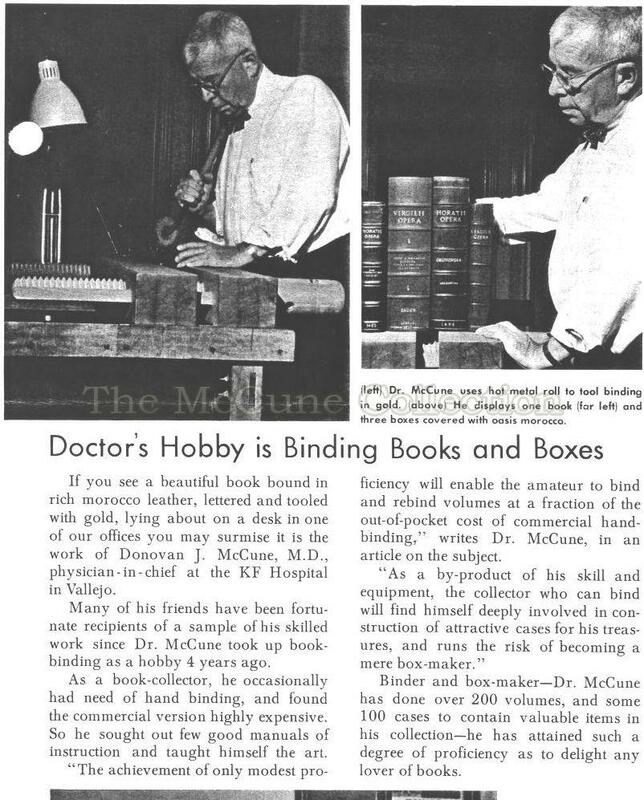 In addition, Dr. McCune would often request unbound copies of books, pamphlets, and other materials from printers so that he could do the binding himself. He would stamp the spine of his rebound books with his personal mark - a gold beagle with the inscription “Beagle Press,” named in honor of his pet beagle, You-You. One outside project he did was the casing for a book by Paul A. Bennett. Some Notes on the Engaging By-Paths and Enduring Pleasures of Fine Bookmaking The casing for the book (dark blue leather) was hand-made by Donovan J. McCune. McCune would rebind the material in full leather and other times in leather combined with special papers. He then would mark these rebound books with gold lettering “Religavit McCune” (i.e., tied on or fastened behind by McCune) followed by the date. 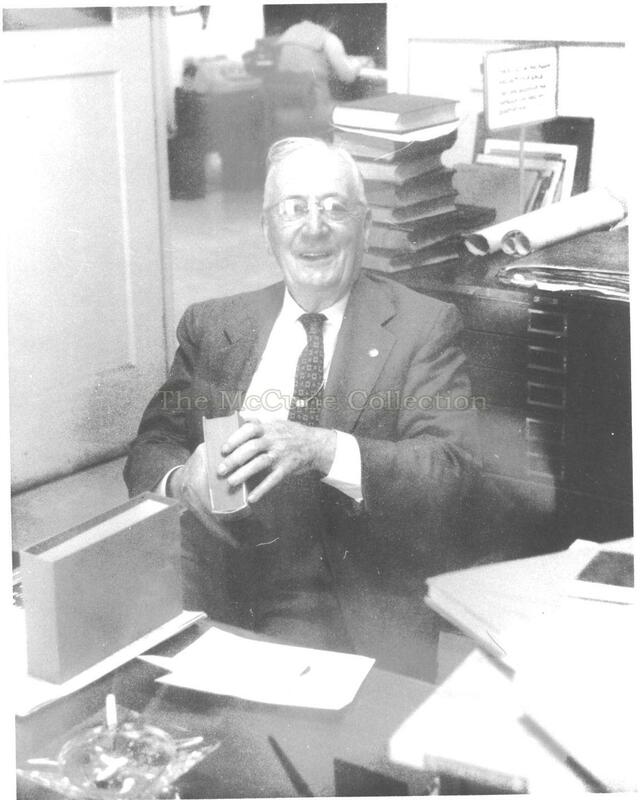 Dr. McCune started his own hand-printing press enterprise early in 1968. As the ritual gift upon retirement from Kaiser Permanente, he elected an Adana Horizontal Quarto Printing Press. This was a small size press that weighed about 31 pounds and whose measurements were 9 ¾ by 7 ¼ inches. McCune described his early foray into hand- printing: “Early in this new career – now three months old – I printed an apprentice-piece, Ad Dante, embodying the only Latin verses I have ever had the nerve to write – and that nearly fifty years ago. The presswork was atrocious.” He then took lessons from Roger Levenson at the Tamalpais Press. Henry Morris of The Bird & Bull Press, advised McCune to change his type of ink, his paper, and to get another type of press. Morris correctly predicted that McCune would soon outgrow his small press. Then in July 1968, Dr. McCune obtained an Albion Hand Press. The Albion was manufactured of iron and steel at London in 1852 by Hopkinson & Cope – the latter having invented it around 1820. The press received the number 3294. It was a demy size (24 x 28 inches) at the platen. This was a very heavy and large machine. It stood approximately 6 foot six inches in height and weighed just under 2000 pounds. Since the Albion was so large and Dr. McCune was only about five foot six inches tall, he had a platform built on which he could stand to operate the press. The plumed finial on top frequently sported a beret to add to the informality of McCune’s printing “establishment”. The kitchen contained the two presses and an iron inking stand; the type cases were kept elsewhere. The Adana press rested on a sideboard. He used both these presses to print various hand-made publications and broadsheets. Although he enjoyed printing, he wrote in one letter that when he printed a 100 copies of a single broadsheet (as he did for the Roxburghe Club), he found it exceedingly tedious. Dr. McCune also was one of the original financial backers of the Heitz Winery in St. Helena. This winery in the Napa valley opened in 1961 and the original winery is still open to the public as a sales and tasting room on the St. Helena Highway. He joined the American Society of Enologist in 1965 and subsequently took a wine study course and received a wine diploma in 1966. You-You was Dr. McCune’s pet beagle (born in 1964). McCune honored his pet by naming his printing press: Beagle Press. According to Roger Levenson, the basic function of Dr. McCune’s Vallejo apartment appeared to be the comfortable maintenance of the aged beagle. Special resting spots were everywhere and the choice places on sofas and the like were “reserved” for this favorite companion. Kenneth Carpenter (University of Nevada, Reno): Founder of Black Rock Press. Dedicated to the practice and teaching of finely printed books. Ted Freedman: Printer employed by University of California Press in Berkeley. Platen Press, Orinda, CA. Roger Levenson: Lecturer on the history of the book at U.C. Berkeley. Publisher of Tamalpais Press, Berkeley. The McCune Collection has copies of certain of Dr. McCune’s correspondence, newspaper articles he saved, medical articles he authored, various versions of his curriculum vitae, and a few photos of Dr. McCune. It also has a file on his Beagle Press printings. Through the effort of Tom Snyder, the McCune Collection now has copies of his medical correspondence from Johns Hopkins Hospital archives and from Kaiser Permanente Heritage Resources. Additional information was obtained by searching the internet. The Harriet Lane Home was the first pediatric clinic associated with a hospital. It eventually treated over 60,000 children a year and became a pioneer treatment, teaching, training and research clinic. Founded in 1887, Babies and Children’s Hospital of New York ranks among the top children’s hospital in research, teaching, and patient care services. It is the primary affiliated hospital with the Department of Pediatrics at Columbia University. 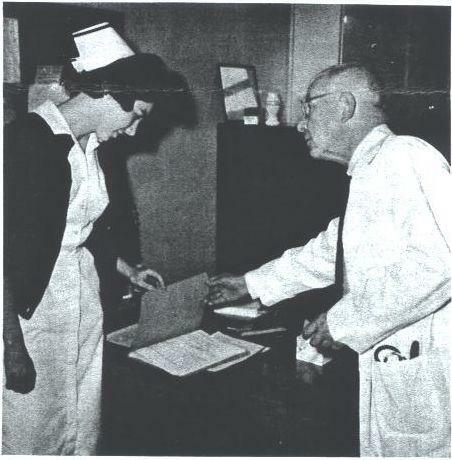 Although Dr. McCune had originally wanted to do his residency at Harriet Lane Home, his mentor, Dr. Edwards A Park, on April 10, 1930, wrote to McCune that the position of resident had been taken by another doctor and would be occupied for several years. Dr. Parks then helped Dr. McCune obtain a residency at Babies Hospital in New York City. See Appendix A for a summary of these two missions. He first learned Latin by phonetic mimicry at age ten from the nuns of the Vincentian Order of Charity in order to serve as an altar boy. Two years later, the nuns offered an introductory course in the language. He once remarked: “I got through Caesar with relief but have returned many times with satisfaction. After Caesar, he studied Cicero and Virgil and committed long passages to memory. Leake had been a guest lecturer at Kaiser the previous month and had been McCune’s guest at the Roxburghe Club when Dr. McCune had been the keynote speaker on his Latin classics. McCune was honorary chief of pediatrics attending staff at David Grant Hospital, Travis Air Force Base. A printing family in France from 1524-1820. This was published by Grabhorn Press in 1963. This keepsake commemorated the dedication of the Morgan A. and Aline D. Gunst Memorial Library. Upon the advice of Roger Levenson of the Tamalpais Press at Berkeley, it was secured from Hewitt Bros. of Field St, London in a close race in which a serendipitous cablegram defeated the University of Texas. The press, a brayer ink-table, and an unclothed 18 inch roller cost $1040 F.O.B. San Francisco; freight and election added $300. He had to reinforce the floor of his kitchen to handle the weight of the Albion. This was a good investment. He bought the press for $1040. Similar presses are now selling for between $5000-7000.